Heat oven to 400°F. 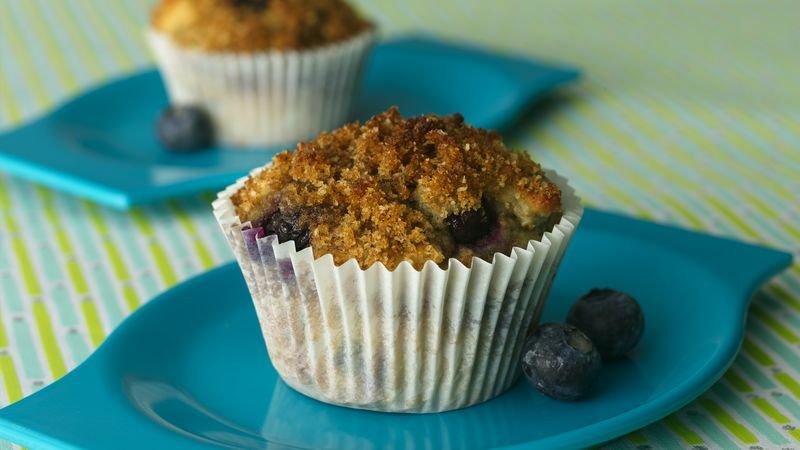 Place paper baking cup in each of 12 regular-size muffin cups, or grease bottoms only of muffin cups with shortening or spray with cooking spray. Place cereal in food-storage plastic bag; seal bag and crush with rolling pin or meat mallet. Set aside. To make topping, in small bowl, mix 2 tablespoons of the crushed cereal, 1/4 cup brown sugar, the cinnamon and margarine until crumbly; set aside. In medium bowl, mix 1/3 cup brown sugar, the milk, oil, lemon peel and egg. Stir in remaining crushed cereal, the flour, baking powder and salt just until moistened. Gently stir in blueberries. Divide batter evenly among muffin cups; sprinkle with topping. Bake 20 to 24 minutes or until golden brown. Mix muffin batter only until all the dry ingredients are moistened. If mixed too much, the muffins will be tough instead of tender.